In my practice I see many shoulder injuries. Patients often come in with shoulder pain, and a rotator cuff tear is diagnosed. I am not a surgeon, so I typically advise conservative treatment for these patients, to start, unless they are a young athlete with an acute injury, as I have seen many people return to full function without the need for surgery. I recommend strengthening exercises, steroid injections, PRP injections, and osteopathic manipulations, depending on the medical history and the clinical symptoms. Most patients vastly improve with these modalities alone. I do, however, have some patients that end up requiring surgical intervention. I decided it would be a good idea for me to calculate the "net treatment benefit" of conservative treatment and surgery, for rotator cuff tears. I wanted to know the Treatment Score for each modality. This way I could actually inform my patients of the success of conservative treatment versus surgical intervention, so as to give my patients the best possible chance for a full recovery, in the shortest amount of time. I went to PubMed to look up studies on surgery versus conservative treatment for rotator cuff tears. I actually found 2 studies on just this! I went to the first study, which is titled, "Surgery or conservative treatment for rotator cuff tear: a meta-analysis." I was able to pull up the abstract, and saw that the conclusion was that conservative treatment was, in fact, just as good as surgery. I wanted to know more: how was the study done, what exactly was the difference in outcomes between the two treatment modalities, what is the actual percent improvement in each treatment? I really was excited to enter these numbers into the STAR™ blocks. I then tried to pull up the full text in order to fully understand the study, and was not able to. I would be billed if I wanted to read the rest of the study! My search was then over. I cannot actually quantify the net treatment benefit of surgery or of conservative treatment for my patients. I cannot go back and tell my patients that I have clear evidence that one way to treat their rotator cuff tear is better than another way. This is a big problem with medicine these days. Neither physicians, nor patients, can easily access all good studies, and determine what the best treatment is. Studies need to be made public so that physicians and patients, alike, can determine the best possible treatment for every disease and injury out there. Research needs to be transparent for full understanding. If we can quantify and compare every treatment for every disease, then we would be able to more effectively eradicate and fix injuries and diseases that affect us every day. Here at Treatment Scores, I am aiming to consolidate this information into an unbiased, and freely accessible source of information so that we can truly move forward in the healing and health of the world. Stem cell treatment for a variety of conditions is becoming more and more mainstream. More and more research is being done to evaluate the efficacy of stem cell treatments in a variety of diseases. I became interested in this particular subject, as I recently had a patient with osteonecrosis of the femoral neck. Hip necrosis can be found in a variety of patient types. It is common in children, young athletes, and patients who suffer from sickle cell disease. It can also be seen in patients who have used short term or long term steroids. The typical treatment for this condition is a hip replacement. This is generally not a good option for young people, as it will require more hip replacements down the line. I found a physician in my area that is treating these young people with bone marrow stem cells. I was fascinated with his new approach to this disease, as it seems to absolve the need for a hip replacement. This treatment has not been around for very long, so long term outcomes are still pending. However, short term outcomes are very promising. Anyhow, I decided to get online and see if any longer term studies have been done on this subject. The only study that I could find evaluated the use of bone marrow stem cells in patients with sickle cell disease. The study I found was a prospective, uncontrolled study. This made it simple to put into a STAR™ block. As you can see above, there was only a 17.4% improvement in the Harris Hip Score after the procedure. However, after taking into consideration the risk of infection from the procedure, the overall treatment grade decreased slightly. Once I added back some points for no longer needing surgery, decrease cost to the patient, and less time lost from work, the overall treatment grade remained the same, despite the number itself increasing. Shooting, stabbing or even throbbing pain radiating from your back to buttock, upper thigh and even your toes! Tingling and numbness, muscle aches and spasms. Limited flexibility. If you can relate to these symptoms, then you probably know all about chronic back pain (CBP). CBP is low back pain that persists for more than 3 months and can make life miserable. It is very common and unfortunately, has no specific pathology. This means any possible treatments prescribed are done so to alleviate the pain and increase range of motion rather than to cure. Effectiveness of conventional standard treatments, such as drug therapy or surgery, has yet to be clearly established. There are, however, many adjunctive and alternative therapies that have been shown to provide some temporary relief from pain. Therapy options may include acupuncture, exercise/physical therapy, and spinal manipulation. The Treatment Grade for acupuncture in CBP patients is “E”. I was surprised by this score, especially since the study was a well-controlled RCT and had highly significant results showing acupuncture was associated with marked clinical improvements. Last AR et al. Chronic low back pain: evaluation and management. Am Fam Physician 2009;79(12):1067-74. Witt CM et al. Pragmatic randomized trial evaluating the clinical and economic effectiveness of acupuncture for chronic low back pain. Am J Epidemiol 2006;164:487-496. Four years ago, a study was completed, which evaluated the effects of IV chelation on cardiovascular disease. This was a huge study, researched over 5 year's time, with almost 2,000 participants. Many physicians in the traditional medical world believed that alternative medical practitioners were "quacks" if they treated their patients with IV chelation. According to traditional physicians, there was no proof that IV chelation actually worked to reduce cardiovascular disease. It was thought that alternative medical doctors were unnecessarily taking money from patients for costly interventions. Alternative medical physicians, on the other hand, argued that traditional medical doctors were, in fact, the ones doing unnecessarily costly procedures to patients, in the name of medicine. While I'm not going to presently evaluate the effectiveness of more traditional cardiac procedures such as stents and angioplasty, I will discuss the recent findings of the TACT study (Trial to Assess Chelation Therapy). The TACT study separated patients into 2 IV chelation groups (with supplements and with placebo supplements) and 2 placebo chelation groups (with supplements and with placebo supplements). The study involved a total of 1,708 patients. The patients selected had a prior heart attack and were over 50 years old. During the trial, the patients were also encouraged to continue their present medications. After 5 years of studying these patients, and each patient receiving 40 total chelations, the results were actually astounding! It was found that the patients who underwent IV chelation had an 18% reduction, as compared to placebo, in all cause mortality (heart attack, stroke, coronary revascularization or hospitalization for angina). In the diabetic patients who were treated with IV chelation, their risk of all cause mortality decreased by 41%! It has been common medical practice for years, to use steroid injections throughout the body to help control inflammation and pain. I have many patients who constantly ask me if steroid injections are just a "bandaid" for their pain, or if the steroid injection is actually going to help treat their pain long term. The knee is a very common location of pain and osteoarthritis. It makes sense, then, that this would be the first location that I would chose to research for the efficacy of steroid injections. There have been many articles published that relate to knee osteoarthritis and the efficacy of steroid injections. After I looked up many articles, I realized that it would be almost impossible to compare more than one article. One reason for this is that, in order for people to study a particular disease, and get the outcomes that they desire, they have so many different inclusion criteria for participants. Some studies cut off participants based on age, some are based on perceived level of pain, and others are based on MRI findings. No of these studies can be compared to the other, as the patient populations all tend to be different. In medicine, we cannot assume that just because one treatment works for one particular group of people, that it will have the same effects on another group. I decided to pick a study that used pain as the basis for their inclusion criteria. This study also measured synovial tissue volume, which is a direct measurement of inflammation in the joint. What I found was actually incredible! The part of this study that amazes me, is that it had to be divided into "responders" and "non responders" due to the high (71%) rate of people who relapsed within 6 months. Above is the score for the non responders, and below is the score for the responders. Despite the poor response to steroid injections of the majority of the participants, the authors still concluded that steroid injections are a good treatment option for patients with knee osteoarthritis. This conclusion actually blows my mind! As you can see above, the main statistic for the non responders is a zero. 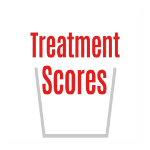 I had to increase that score to a 1, just so that it would register in our treatment calculator and get a grade. But, after 6 months, most of the people in the study had increased pain as compared to baseline. I'd say this is a good enough reason for a low grade. Below is the score for the responders (23% of participants). This score was increased due to a decrease in pain and a decrease in inflammation after 6 months. As you can see above, the treatment grade overall for steroid injections to the knee is extremely low. Admittedly, I only graded the injection at the 6 month follow up point. Had I used the 1 week point of follow up, the score definitely would have been higher, as people did respond quickly to the injection. But this is not what I was interested in. Though some people are interested in short term relief of painful symptoms, most patients at least want to know long term outcomes of treatment. Though patients did have decreased knee pain after a week, most patients had increased pain from baseline after 6 months. I would not call this a successful treatment. Additionally, in this study, higher doses of steroids were used than in a typical practice, which may make the results appear even better than they may have if using therapeutic doses of steroids and not supratherapeutic dosing.